No, I don’t mean “outtakes.” Those are scenes that never made into the movie. I’m going to serve up some tasty spiritual takeouts from the movie: scenes and themes to take with you into your day. But first, if you haven’t seen the movie yet, do it! It’s a computer animated kids’ movie. But don’t let that stop you. 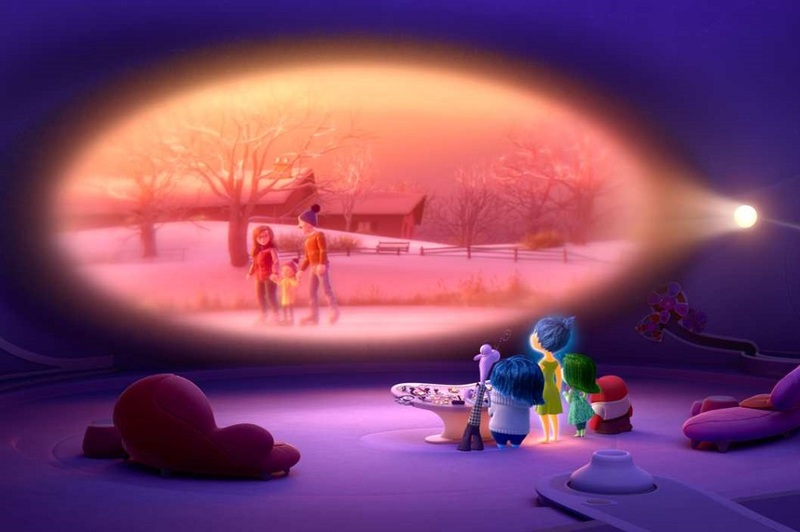 Inside Out serves up plenty of thought-provoking and heart-tugging material for adults, too. And it looks set to go down as one of the best and most original movies from one of the best and most original animation studios in the movie business. If you haven’t yet seen a Pixar movie, this would be good place to start. What’s Inside Out all about? The plot involves 11 year old Riley, who is going through a major life transition. She must leave behind her happy childhood home in Minnesota when her father takes a new job in San Francisco. But the real action takes place inside Riley’s head. And the main cast of characters are her five basic emotions: Joy, Sadness, Anger, Fear, and Disgust. These five are personified and brought to life inside the spacious world of Riley’s mind, where they vie with one another to run the control panel inside her mental “headquarters.” As Riley’s outer life unfolds, we watch the story of her emotions driving all the action behind the scenes. Now here are five spiritual takeouts based on key themes in the movie. In today’s rational and scientific world, we like to think that our beliefs and ideas drive our actions. The driving force behind everything we think and do is our emotions. The things we love, our feelings of joy and sadness, anger, fear, disgust—and, of course, our many other emotions—are what make us tick. Yes, our thoughts and ideas are important. They guide us one way or another as we pass through the events and experiences of life. But behind every thought and idea is some love or emotion. If we didn’t have a love and affection for various ideas and ideals, we wouldn’t bother with them. Scientists are fascinated by the intricacies of nature, and enjoy studying it. Lawyers love the law, and the justice they can bring about by means of it. Ministers love spiritual truth, and enjoy teaching and guiding the people according to it. Teachers love to enlighten the minds of their students with new ideas and new understanding. Doctors and nurses love the ability to heal gained through a knowledge of human anatomy and physiology. No matter what your calling, job, or career, you must learn the ropes in order to get the things done that some love or emotion in you wants to do. Sure, it might just be making money. But unless you’re in love with money itself, even making money is done to accomplish things you care about, such as keeping yourself and the people in your household alive and well. Pixar got it right when they made the main characters inside Riley’s head emotions rather than thoughts and ideas. As we go through the movie, we see each of these emotions, and all of them together, coming up with many bright ideas (and some not so bright ideas) to carry out their particular goals and drives. Spiritual takeout #1: Our loves and emotions are the driving forces of our life. Our thoughts, ideas, and actions follow from them. 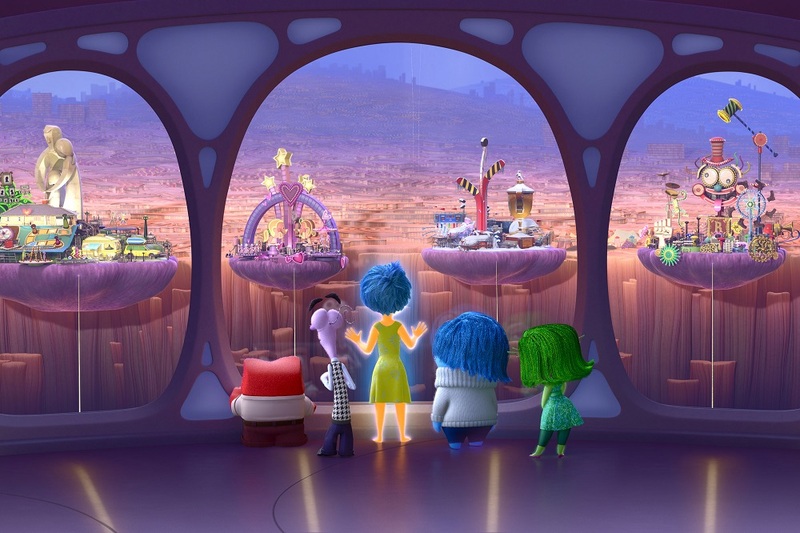 Inside Out brings alive the world inside our head—the world of the human mind. Modern science pictures the world of the mind as a realm of firing neurons and electrochemical reactions. But that’s only how it comes out in our physical brain. In the world of the mind as we experience it, there are fields and flowers, buildings and roads, whole worlds of imagination, abstract thought, and memories of past experiences, feelings, and thoughts. This is the mental world in which we actually live within our minds. It is not mechanical or chemical. It is alive with all of the things we remember, think, and dream. 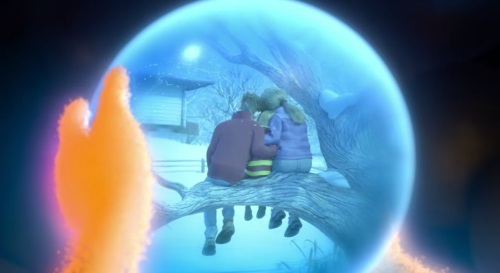 This is the world where the main action of Inside Out takes place. The emotions themselves are personified as girls and boys, men and women, each with a distinct personality and contribution to the action in our minds. These emotions live in a landscape representing both the conscious and the unconscious mind. The conscious mind is represented especially by the “headquarters” in which the various emotions go about their daily activities. Headquarters is located atop of a high tower that overlooks the landscape of Riley’s mind. Tethered to it by strands from various core memories are “personality islands,” which for the 11-year-old Riley are family, friendship, honesty, hockey, and goofball islands. Beyond the islands of personality are the vast, labyrinthine warrens of Riley’s long term memory banks. And down below, in a deep chasm, is the “memory dump” where old, forgotten memories go, never to return. Down in those depths we also find the murky realms of the subconscious mind. Is all of this real? Or is it just the fanciful brainchild of the Pixar animators? According to Emanuel Swedenborg (1688-1772), the realms of the mind are very real. And they do include vast landscapes of mountains and rivers, trees and houses, libraries and buildings, and all of the other things that we see around us, and experience within the world of our mind and imagination. That world of the mind, Swedenborg says, is the spiritual world. And even though we normally can’t see it visually while we are living here on earth, if anything it is even more real than the material realm that we see and perceive with our physical senses. When we die, Swedenborg says, we will live in that world of the mind, along with many spiritual friends and family who have gone there before us. In fact, we are living there right now, even if we don’t realize it. With Inside Out, Pixar has immersed us in that very real world—even if it is a computer animated version of it. That world is both a metaphor and a reality. Its scenery represents metaphors of our emotions, ideas, and memories. But it also presents an artist’s conception of what those mental realities may actually look like when our spiritual eyes are open to see them. Spiritual takeout #2: Our mental and emotional world is very real. It contains everything we see around us in the material world. And yet, the same things that are physical and objective in the material world are metaphors and visual representations of the realities of the human mind as they exist in the spiritual world—which is the world of the human mind. Joy runs the show, and keeps Riley happy and motivated. Fear keeps Riley safe from many dangers. Anger ensures that there is justice and fairness in Riley’s world. Disgust warns Riley against things that would poison her physically or socially. And Sadness . . .
Well . . . as the movie begins, Joy, the narrator, isn’t sure what Sadness does for Riley. In fact, Joy rather resents Sadness, and continually tries to sideline her and keep her out of the action. However, a key plot element is the discovery of the role of Sadness. As it turns out, Sadness, like Joy, has a crucial role to play in keeping Riley’s young life on track. But no spoilers on that one! You’ll just have to watch the movie for yourself. The main point is that there are no wasted emotions. If we have an emotion, it is there for a reason. Granted, it’s best not to let some emotions take charge of our mind. If we are continually driven by fear and anger, we will have a dark, unsatisfying, and unsuccessful life. And yet, sometimes it is essential to be fearful. There are things we should be afraid of, and steer clear of in our fear! And sometimes it is right to be angry at the unfairness and injustice we see both around us and in our own hearts. That anger drives us to right the wrongs of society—and the wrongs in our own motives and beliefs. 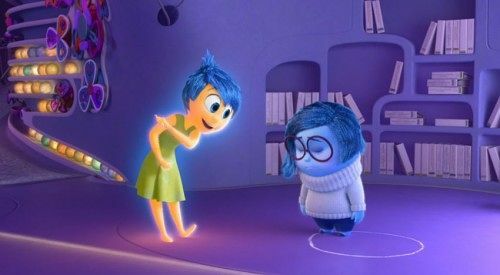 Are emotions like people, as portrayed in Inside Out? Perhaps more than we think! In other words, Swedenborg interprets all of the people in the Bible as representations of the various loves, emotions, thoughts, ideas, beliefs, and motives that drive and direct our lives during our lifetime here on earth. And as we read the Bible story, we find that every character, good and bad, has its purpose and its role to play in the unfolding story—which, at a deeper level, is the story of our spiritual life. Spiritual takeout #3: Every emotion, thought, feeling, love, idea, and motive we have is there for a reason. Some of them may need to fade away over time and give way to others. But if we are thinking or feeling some particular thing, it is good to pay attention to it. It is good to consider what role that emotion is playing in our life, and how it is either moving us forward or holding us back. In the opening scene of the movie, the newborn infant Riley forms a sweet and joyful memory of her parents looking at her with love in their eyes. These and many other early memories of love and friendship with her family and friends form the backbone of Riley’s life and character. Psychologists tell us that our experiences during our first five years of life shape our character for the rest of our lives. And we know that it is crucial to experience at least some human love and caring during those early years. Those early core memories of love and friendship become a key driving element of Riley’s story. She carries those memories with her wherever she goes. When life gets hard, and those memories begin to fade and turn sad, her whole character begins to crumble. Yet when she is at her lowest point, it is these precious, faded memories that bring her back to life. It is her past experiences of love and happiness with family and friends that pull her through. Even her imaginary childhood playmate comes to life, and powers her toward embracing the new phase of her life that is now beginning. Over two centuries ago, Swedenborg wrote about these crucial early memories of love and understanding. Without them, he said, we would die. We would have no basis on which to build a life. And, he said, they are essential to our process of moving on to a new and better life—which is the same as our journey of spiritual growth. In its own fanciful way, Pixar’s Inside Out illustrates this key psychological and spiritual reality of our life. It may not be surprising that for Swedenborg, this concept of lasting memories of love and understanding came from his study of the Bible. Swedenborg noticed that every time the people of the Bible experienced a major disaster, there was always a group of survivors. These survivors, who are sometimes called “remnants” in the Bible story, were the seeds from which a new life and a new community grew. When the Great Flood wiped out almost all life on earth, at least two of each species of animal, and one family of humans, was preserved in the ark to repopulate the earth. When the enemies of Israel invaded their land and killed many of their people early in their history, there were always some Israelites remaining to rebuild. When the people of Israel were carried away captive, first to Assyria and then to Babylon, a remnant of the people later returned to the Holy Land to rebuild the Temple and their culture. Even in the political and religious corruption that engulfed the earth at the time Jesus Christ was born, there were a few righteous people who sought the truth. These people kept Jesus safe in his infancy, and later some of them became his followers. Amid the slaughter and devastation of the apocalyptic book of Revelation, there were always some good and righteous people remaining who would move forward to become the inhabitants of the holy city, New Jerusalem. Spiritual takeout #4: No matter how bad things get for us, there are always precious memories of love, compassion, understanding, and friendship remaining from earlier times. These precious remnants, these lasting impressions of love and understanding can give us the strength to rebuild our lives, and begin a new and better phase of our spiritual journey. And incidentally, whenever we can give to others, children or adults, experiences of love, support, understanding, and friendship, we are adding to their emotional and spiritual life in ways more powerful than we can imagine. Movies and novels thrive on conflict. One of the key conflicts of Inside Out is the struggle between Joy and Sadness over those precious core memories that define Riley’s life. As Joy proudly points out, most of Riley’s memories up to the big move at age eleven are happy memories. Joy has long been the dominant emotion in Riley’s life. Pixar’s Inside Out: Sad or Happy Memory? But when her happy life is rocked by the earthquake of her family’s move to San Francisco, that joyful past is shaken. As she looks back and realizes that those happy days of her young childhood are over, Sadness begins touching those bright, yellow, happy memories, and turning them sad and blue. The memories are still of the same events. But because she now looks back at them with wistfulness and a sense of loss, they are no longer bright with their former cheerfulness and joy. Riley realizes that her life will never be the same, and those formerly happy memories become tinged with sadness. As I mentioned earlier, during the course of the movie Riley comes to understand the key role that Sadness plays in moving her life forward. And she does move on to new life and new happiness in the end. It is a more complex life, and her happiness is less pure than her childhood happiness. Yet her new life also involves greater accomplishments and a greater sense of depth and satisfaction in life. Now she can look back on those early childhood memories and see them with a richer texture of emotions and a more nuanced understanding of their meaning. Now she can see that Sadness has always had a role to play—even in bringing about some of her happiest moments. We humans live in an arrow of time that goes only in one direction: from the past toward the future. Though we can remember and reminisce about the past, we can never go back to it. Our life keeps moving forward. However, as we look back on our life from a more experienced perspective, we can see new meaning in those earlier events. We can see more clearly how each experience, good and bad, fits into the wider tapestry of our life. Riley’s new life in San Francisco has many remaining elements of her old life in Minnesota. Her parents are still with her, and still love her very much. She still goes to school and plays hockey. She makes new friends, and builds a new life on the foundation of character that was built during her old life in Minnesota. And as she looks back over her life, she sees new and deeper meaning in her earlier life experiences. Isn’t it the same for us? We can never go back to our past life, as much as we may sometimes wish we could. But looking back on our old memories, we can find new meaning in them. We can see new depths in those old experiences and old friendships. We can see how everything that we have experienced and lived through in the past was building our character and preparing us for our life in the present, and in the future. Our old memories then take on a different hue. They were the same experiences as ever. They are fixed in the past, and cannot change. And yet, our present experience of them can change. Yes, in the movie past experiences changed from joyful to sad. Yet the movie implies that this sadness was healed over time as Riley had new experiences and made new memories built upon the foundation of those earlier childhood memories. We, too, can heal the memories of our past. As we grow older and (we hope) wiser, we can look back on our earlier life with new and more perceptive eyes. We can see how even the sad, painful, and destructive passages of our life were building us into the person we are today. As we move forward toward new and better things, toward greater wisdom and love, toward greater accomplishments, we can heal the wounds of past memories, and see them from a more complex and nuanced perspective. We can see them in a new and clearer light. Spiritual takeout #5: No matter what our past experience and memories, as we move forward in life we can see them in a new light, and heal the wounds and sadness of our past. Our present experience and direction changes our experience and perception of our earlier life. ‹ What is the difference between the Swedenborgian and Oneness Pentecostal doctrines of God?